We are excited to announce that Dr. James F. Boynton—our board-certified plastic surgeon—has been named to Houstonia magazine’s esteemed list of “Top Doctors” for 2017! This year marks the third time Dr. Boynton has been recognized for his plastic surgical expertise in the popular community magazine, which focuses this segment of its publication on bringing the best of the best into the spotlight for Houston citizens seeking medical care, restaurants, legal representation, and more. To compose the 2017 list of top physicians, Houstonia sent a survey to thousands of physicians and nurses practicing in and around the city of Houston. On this survey, a single question was asked: “If you or someone you loved needed medical care, whom would you choose?” When the answers came back, Dr. Boynton was among only 19 plastic surgeons in the greater Houston area to receive enough votes for inclusion on the “Top Doctors” list for plastic surgery. In regard to the honor, Dr. Boynton says he is incredibly grateful to be viewed by his medical peers as top practitioner of aesthetic medicine, and he hopes both current and future patients see the recognition as a testament to his devotion to providing the highest level of care possible. 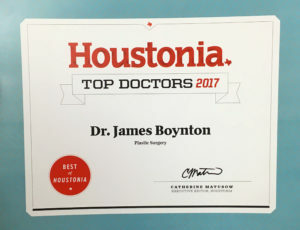 To learn more about Houstonia’s list of Top Doctors for 2017, or if you are interested in plastic surgery and would like to schedule a consultation with Dr. Boynton, we encourage you to contact our practice today.